Do You Have A Fear Of Needles And Going To The Dentist? We Have A Solution! Do fears of needles keep you away from the dentist? If so, you’re not alone. As many as 40 million Americans refuse to go to the dentist because of a fear of needles. 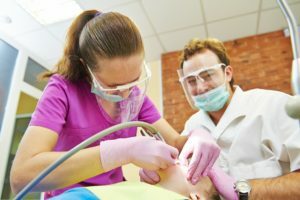 Postponing dental procedures because of these fears is common, but ultimately results in worsening problems and other serious oral health concerns. At our practice, Premier Dental Care in Herndon, we are excited to now offer a patented technology that uses direct vibration to eliminate pain from injections and create an anxiety-free dental experience. The DentalVibe is a unique tool that can help alleviate dental fear and anxiety. The DentalVibe applies a light vibration to the tissues around the injection site while anesthesia injections are administered. Research has shown that when vibration and injection sensations are occurring simultaneously, the vibration feeling reaches the brain first and essentially blocks the feeling of the injection from being perceived by the brain. Children and adults no longer have to be afraid of the needle. If you would like to see the dental vibe in action watch this video. If you would like more information about DentalVibe or to schedule your next appointment please contact our office today! Comments Off on Do You Have A Fear Of Needles And Going To The Dentist? We Have A Solution!